When it comes to temporary tattoos we offer options for every age, theme and gender. Here’s some Frequently Asked Questions, contact us for more information or assistance. How many can an artist do per hour? Depending on how elaborate you would like our artists to be our numbers vary. For a party where you want everyone to get a tattoo and you have a ton of guests, we would recommend simplified designs that would take about 3-5 minutes each. Our artists could do about 17-20 per hour at this pace. If you would like us to offer more elaborate designs they would estimate 7-10 minutes per design, and our artists will get through about 10-12 per hour. What’s the best age group for Henna Tattoos? Henna is best appreciated by 15+. We are happy to do any age group and mixed age and theme family parties are wonderful, our recommendation is based on the time it takes a tattoo to dry and the time a tattoo lasts on the body. Yes! Our artists use all non-toxic Henna, made from dried henna leaves as well as a variety of other natural ingredients sometimes including lemon/lime juice, black tea, coffee, rose petals, essential oils or cloves. How long will the tattoo take to dry? What color will my henna tattoo be? Once the henna stain has dried and completely chipped off of your skin the air will begin to oxidize and darken the stain. The result will be a tattoo that is red, orange or brown depending on your skin chemistry and the length of time you allow the stain to sit before scraping it off. How long will my tattoo stay on? The longest henna will stay on is 2 weeks. How many designs can we pick from? Our artists will bring 25-30 designs to choose from. How many airbrush tattoos can an artist do per hour? 20-25 tattoos per hour or more on average. Yep! Airbrush paint is all non-toxic and lead free. What’s the best age group? 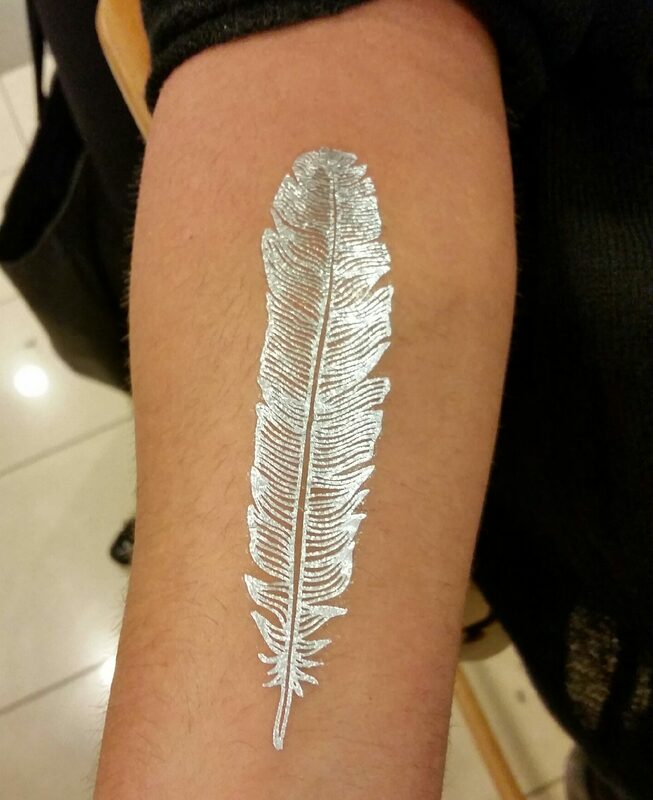 Airbrush tattoos are great for all ages! We can do tattoos themed for 4 year olds or tattoos themed for 40 year olds, just let us know! Our artists bring 30-40 designs to choose from. How long will the tattoo stay on? Most tattoos will stay on for up to a week, but if you want to remove it sooner, you can use rubbing alcohol. Yep! We use face/body paint that is all non-toxic and lead free. Body Paint takes a little longer then airbrush tattoos to dry, maybe 5-7 minutes, but is still great for all ages! Body Paint can be washed off the same day.